Total privacy, spectacular views, delectable local food…Solitaire Lodge has it all when it comes to escaping from everyday worries, spending your days admiring nature and relaxing at your own pace. 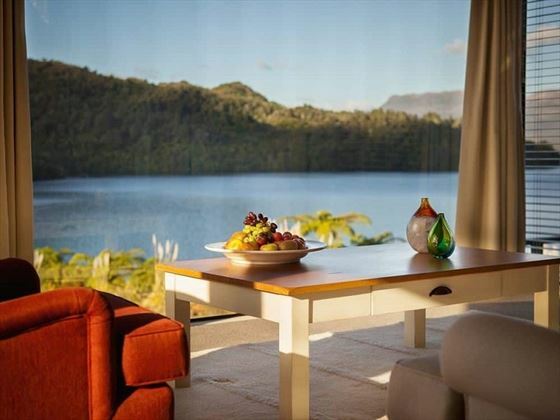 Perched right next to the glistening waters of Lake Tarawera, and with a dramatic backdrop of bright green mountains, we’re certain this lodge will take your breath away. With only 10 suites, the ambience here is secluded and tranquil, and the décor evokes a sense of bringing the outside in. With large windows overlooking the bay, expansive balconies and pretty décor, they’re the ideal spot to rejuvenate with an in-room massage, or simply drink in the views as the sun sets. 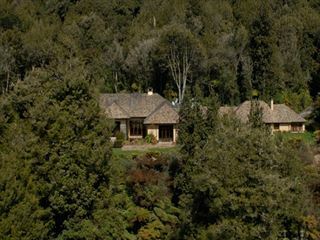 The food here is created with local ingredients picked from their own gardens or nearby orchids, focusing on introducing guests to New Zealand’s fresh flavours. Whether you’ve packed up a picnic to sit by the lake, or you’re tucking into a decadent five-course dinner, Solitaire Lodge will take you on a culinary journey. The intimate setting really helps to create a completely relaxed feel, perfect for unwinding. Nevertheless, should you fancy a bit of activity there is plenty to see and do. 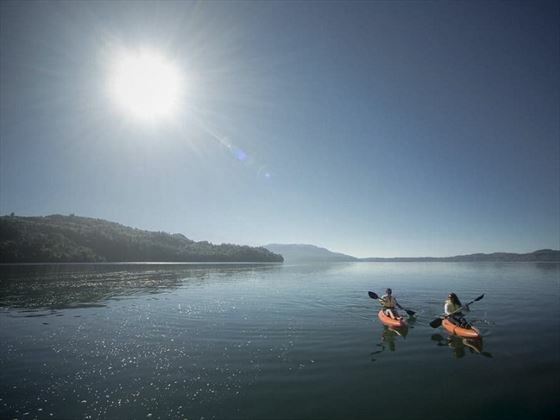 Grab one of the lodge’s motorised dinghies or kayaks and float along the completely still lake, wander through the native bush on one of the walking trails, take a dip in the lake or a nearby shallow beach, or even stroll along to the nearby natural hot water pool, adorned with geysers and natural springs. 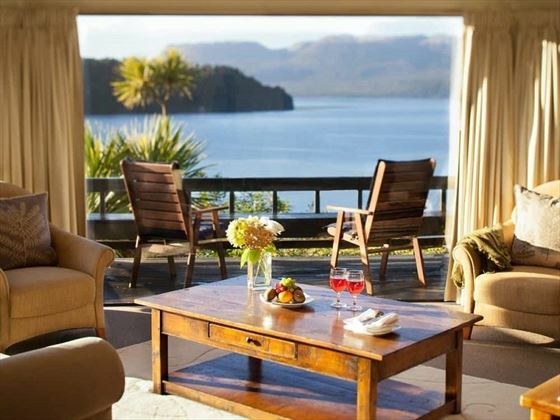 This pretty lodge is nestled by the sweeping, sparkling waters of Lake Tarawera in Rotorua. With a backdrop of soaring mountains shrouded in luscious green flora, the ambience here is secluded, soothing, and incredibly peaceful. 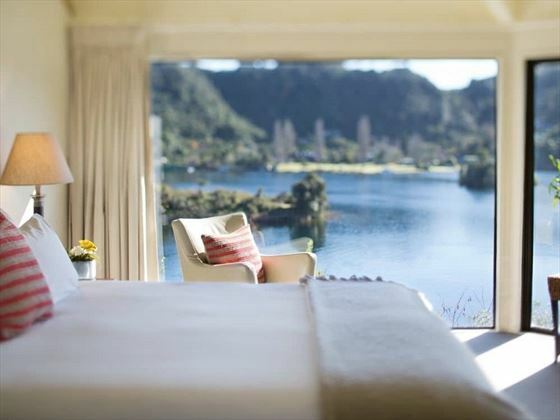 Executive Suite – Gorgeous 33sqm suites overlooking the luscious lake or bay, featuring a cosy lounge area, a large wall of windows, and an expansive balcony. 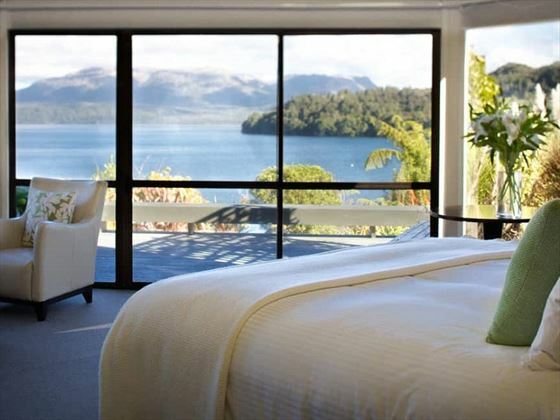 Tarawera Suite – Spacious 70sqm suites with wonderful floor-to-ceiling glass windows that look out onto the bay and up to the soaring summit of Mount Tarawera. Featuring a peaceful sitting area and a separate dining room. Villa Suite - Bright and airy two-storey detached suite. The ground floor features a master ensuite bedroom, a living/dining area and a gorgeous outdoor deck overlooking the bay, whilst the second floor has another spacious ensuite bedroom with two single beds. 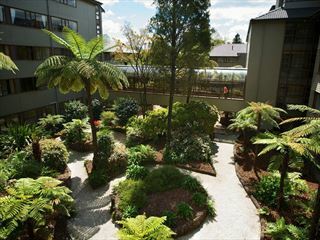 Can be booked as a one bedroom suite or a two-bedroom suite. Solitaire Suite – Located in a separate building, this 70sqm suite is perfect for those looking for more seclusion. 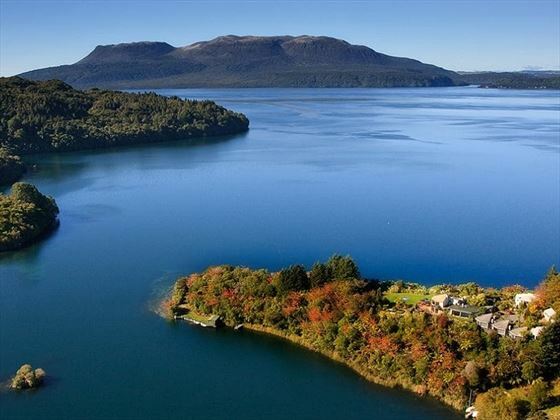 Featuring picture windows overlooking the sparkling Lake Tarawera, a large master bedroom, a smaller guest bedroom, a lounge, and a picturesque, private sundeck. 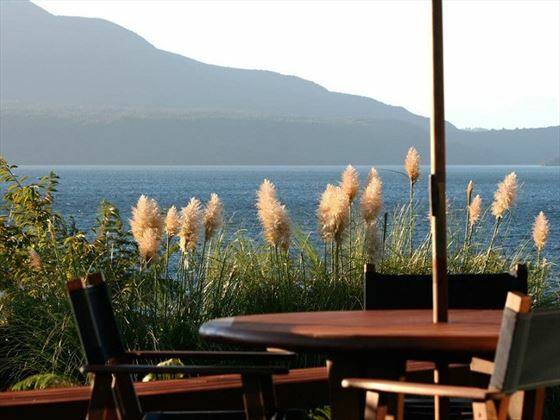 Expect divine, locally sourced cuisine at Solitaire Lodge’s restaurant. With ingredients freshly picked from the lodge’s gardens and nearby orchards in Whakatane and Katikati, you’ll enjoy deliciously flavoursome and fresh dishes during your stay here. There’ll be ample opportunity to try indigenous produce, including Kumara, edible plants and Maori potatoes, too. Breakfast includes a tasty seasonal buffet and a la carte options, whilst lunch can be enjoyed on the scenic outdoor deck, or you could pack up a picnic and nestle down for a light lunch in the luscious landscapes. Dinner is an extravagant affair, with five courses emphasising New Zealand’s local produce, all paired with an exquisite wine from the wine cellar. A set of five incredibly indulgent villas, nestled on a private ridgeline on an island-like peninsula and overlooking the Bay of Islands. 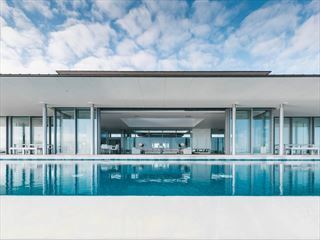 From infinity pools perched on the edge of flora-abundant cliffs, huge windows letting in natural light, and resident chefs creating delicious cuisine in your gourmet kitchen, these villas are very luxurious.